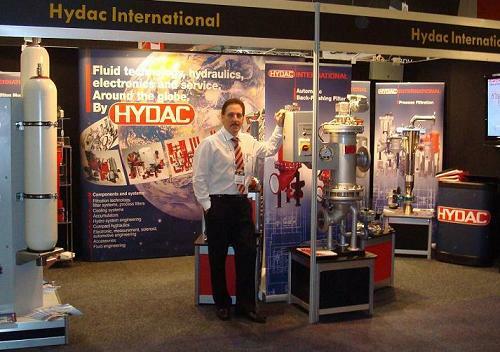 In March 2010 HYDAC took part in Australia’s largest oil and gas industry exhibition. The exhibition continued the tradition of bringing together the industry’s leading companies and people. This year the exhibition attracted over 9,000 visitors and 500 exhibitors and we are proud to say that HYDAC Pty Ltd. was the only Australian based hydraulics company. The exhibition enabled us to showcase our exciting range of new products, all of which were received extremely well. There were many visitors intrigued by what HYDAC had to offer and a number of new business ventures were formed as a result. Our colourful stand grabbed the visitor’s attention and our ideal selection of display products then went on to show visitors what HYDAC is all about. 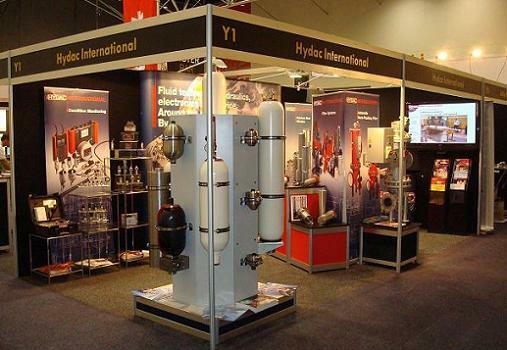 Above: A wide range of products such as accumulators and filter systems were displayed as a showcase for HYDAC’s product range for the oil and gas industry. Above: Mark Keen, Managing Director for Australia and New Zealand also attended the show. It’s safe to say that the show was a huge success and we hope you can join us over there next year!